Nate Thomas with his Emmy. California State University, Northridge film professor Nate Thomas has won a regional Emmy Award for a television public service ad (PSA) campaign he produced and directed for the FBI on intellectual property theft. 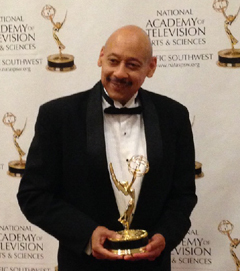 Thomas received the honor this past weekend at the National Academy of Television Arts and Sciences 40th Annual Pacific Southwest Emmy Awards gala in Carlsbad. The award-winning work included three ads on music piracy, bootleg clothing and stealing trade secrets. Thomas said the win was particularly “sweet” given the fact he made the project with the help of CSUN faculty and students. The project was done through Thomas’ production company, Nate Thomas & Associates, which specializes in making PSAs. “I call it doing social work using film and other media,” he said. Working with federal law enforcement officials and assisted by a team of CSUN students and faculty, Thomas created a series of 30-second ads last year as part of a national campaign to educate the public about intellectual property theft and cyber bullying. CSUN Department of Cinema and Television Arts students worked alongside seasoned industry journeymen in a variety of capacities behind the camera to create the spots. Editing of the PSAs was done by CSUN students under the supervision of film professor Michael Hoggan, A.C.E, a respected film and television editor with more than 30 years of experience in the industry. In all, Thomas said, more than 20 CSUN film students, faculty and staff worked on the project. Commissioned by the FBI and the U.S. Department of Justice, the ads have been shown as public service announcements across the country.